There’s a difference between learning and knowing. You can sit through a multi-day course learning how to sell, only to realise a month later that you’ve forgotten most of what you learnt and no longer know what you need to know. There’s a reason for that – it’s called, ”The Forgetting Curve”. Our little-and-often approach is different and more effective – everything we do and the way we do it is designed to improve lasting knowledge retention and behaviour change. ​​There are three levels (stars) of proficiency per competency. When an individual has achieved at least one proficiency star for each competency the individual can start building up “Athlete” stars. 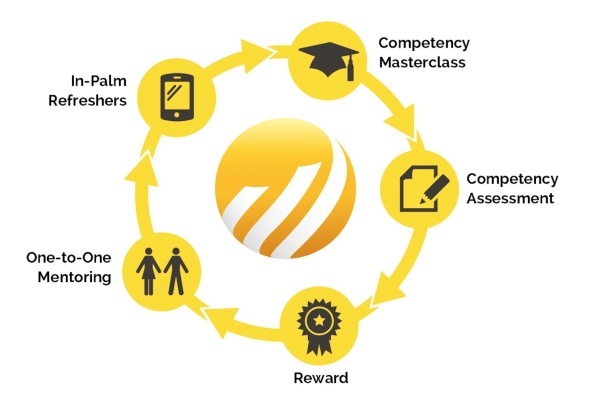 Gamifying the learning experience in this manner encourages learners to take responsibility for their own personal development – increasing the rate of improvement.